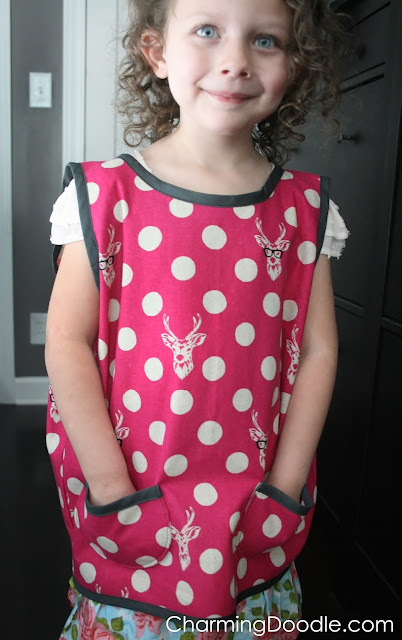 I'm continuing the Sewing for Kindergarten series with a tutorial on adding round pockets to a paint shirt (or anything else you want to add round pockets to). Remember this post where I made a paint shirt for Elliott last year? Well, it's Emma's turn to go to Kindergarten and she needed a cute paint shirt too. Thankfully I had written the tutorial last year because it's what I followed to make Emma's. I won't focus much on how I made this paint shirt since I wrote about that here, but I'll show you how to add round pockets to the shirt. First I cut out my paint shirt based on a t-shirt that fits my daughter now. I decided to add round pockets to match the polk-a-dots on this beautiful echino fabric. To cut out the main part of the pocket, take a bowl that is the size you want for your pocket and trace around it onto the fabric. Cut out 4 of these circles. Cut off the top of the circle a little bit so you have an opening wide enough for your child's hand to fit into the pocket. Take two of your semi-circles and place them right sides together. Stitch around the pocket (leaving the top open) with a 1/4 inch seam. Clip the corners of the pocket so it will stay nice and flat later. Now take your bias tape and wrap the end around one edge of the top of the pocket. Now fold the other side of the tape over so you have a nice enclosed edge. Sew the bias tape down along the lower edge. When you get to the other side of the pocket you can fold the bias tape in the same way you did above to finish off the other side. Pin the pocket to the paint shirt and sew around it as close to the edge as you are comfortable sewing. Now you can finish the rest of your paint shirt by hemming it or using bias tape along the entire edge (like I did). Your little one will love their new pockets! Thanks Jen! I fell in love with it when I saw it at a little store in Minnesota. It's echino. Maybe it's available online?? So cute! I love Echino!